Your world needs to be predictable. It needs to be ordered and planned. So you instinctively impose structure on your world. You set up routines. You focus on timelines and deadlines. You break long-term projects into a series of specific short-term plans, and you work through each plan diligently. You are not necessarily neat and clean, but you do need precision. Faced with the inherent messiness of life, you want to feel in control. The routines, the timelines, the structure, all of these help create this feeling of control. Lacking this theme of Discipline, others may sometimes resent your need for order, but there need not be conflict. You must understand that not everyone feels your urge for predictability; they have other ways of getting things done. Likewise, you can help them understand and even appreciate your need for structure. Your dislike of surprises, your impatience with errors, your routines, and your detail orientation don't need to be misinterpreted as controlling behaviors that box people in. Rather, these behaviors can be understood as your instinctive method for maintaining your progress and your productivity in the face of life's many distractions. Don't hesitate to check as often as necessary to ensure that things are right. You feel an urge to do it anyway, and soon enough others will come to expect it of you. 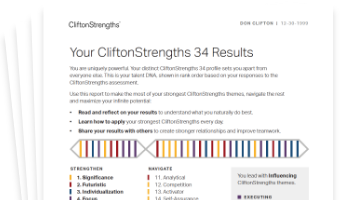 See how Discipline shows in your CliftonStrengths results -- discover All 34 CliftonStrengths Themes today!